Eduard Bernstein (January 6 1850 - December 18 1932) was a German social democratic theoretician and politician, member of the SPD, and founder of evolutionary socialism or reformism. With the passing of Karl Marx (1818-1883) and Friedrich Engels, Eduard Bernstein (1850-1932) was recognized as a major socialist thinker and, in many socialist circles, as the founders' successor. In the years following Engels' death, Bernstein took an increasingly critical view of Marx, beginning with his recognition that Marx's prediction of capitalism's imminent demise in Das Kapital sharply conflicted with the emerging realities of industrialized European states where market forces gained strength and where the living conditions of workers were gradually improving. Bernstein rejected key ideological tenets of Marx, including Marx's economic theories and dialectical materialism. Bernstein concluded that Marx's worldview was unfounded; however, he respected and urged fellow socialists to uphold Marx's intent to improve the living conditions of the laborer. He maintained, however, that violent revolution was unnecessary and that social reform could be effected through the ballot box. He favored advancing the rights of workers and increased state intervention in the economy but in the context of a democratic society based on rule of law. If Bernstein's democratic views had prevailed over the partisans of violent revolution such as Vladimir Lenin (1870-1924) and Leon Trotsky (1879-1940), the repression and genocide that characterized totalitarian communist states such as Stalinist Russia, Mao Tse-tung|Maoist]] China, Pol Pot's Cambodia, and North Korea might have been avoided. Bernstein's thought did shape the views of today's pro-democratic social democratic party of Germany, the Socialist Party of France and the Labor Party of the United Kingdom as well as numerous other socialist political parties. In post-communist societies, communists have tended to revert over the past two decades and embrace pro-democratic political positions that parallel Bernstein's. Bernstein was born in Berlin on January 6, 1850. 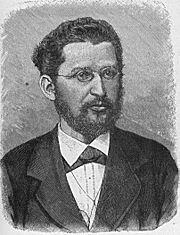 His political career began in 1872, when he became a member of the Sozialdemokratische Arbeiterpartei, the so-called Eisenachers (named after the German town Eisenach). Together with August Bebel and Wilhelm Liebknecht he prepared the Einigungsparteitag ("unification party congress") with Lassalle's Allgemeiner Deutscher Arbeiterverein in Gotha in 1875. This initiative was necessary because of the sharp rift that had occurred within the socialist ranks due to Marx's emphasis on revolution as the means to bring about change, which led to the collapse of the First International by 1874. From 1878 on, Bernstein was the private secretary of social democratic patron Karl Höchberg, working in Zürich; 1888, he was expelled from Switzerland due to pressure from Prussia and moved to London, where he had close contact with Friedrich Engels. Between 1880 and 1890, Bernstein published the magazine "Sozialdemokrat" ("Social Democrat"). In 1881, he was one of the authors of the Erfurt Program, and from 1896 to 1898, he released a series of articles entitled "Probleme des Sozialismus" ("Problems of Socialism") that led to the revisionism debate in the SPD. He also wrote a book titled "Die Vorraussetzungen des Sozialismus und die Aufgaben der Sozialdemokratie" ("The Prerequisites for Socialism and the Tasks of Social Democracy") in 1899. The book was in sharp contrast to the positions of August Bebel, Karl Kautsky and Wilhelm Liebknecht. Rosa Luxemburg's 1900 essay Reform or Revolution? was also a polemic against Bernstein's position. In 1901, he returned to Germany, following the lifting of a ban that had kept him from entering the country, and became a member of the Reichstag from 1902 to 1918. He voted against the armament tabling in 1913, together with the SPD fraction's left wing. From July 1915 he opposed World War I and in 1917 he was among the founders of the USPD. He was a member of the USPD until 1919, when he rejoined the SPD. From 1920 to 1928 Bernstein was again a member of the Reichstag. He retired from political life in 1928. Bernstein died on December 18 1932 in Berlin. A commemorative plaque is placed in his memory at Bozener Straße 18, Berlin-Schöneberg, where he lived from 1918 to his death. Evolutionary Socialism: A Criticism and Affirmation (1899) was Bernstein's most significant work and was principally concerned with refuting Marx's predictions about the imminent demise of capitalism. In it, Bernstein pointed out simple facts that he took to be evidence that Marx's predictions were not being borne out: he noted that the centralization of capitalist industry, while significant, was not becoming wholescale and that the ownership of capital was becoming more, and not less, diffused. He also pointed out some of the flaws in Marx's labor theory of value. Bernstein and his supporters argued against social revolution and favored democracy as the vehicle that would lead to socialism. In its totality, Bernstein's analysis formed a powerful critique of Marxism, and this led to his vilification among many orthodox Marxists. Bernstein remained, however, very much a socialist, albeit an unorthodox one (he was hostile to Trade Unions and Producers Co-operatives); he believed that socialism would be achieved through capitalism, not through capitalism's destruction (as rights were gradually won by workers, their cause for grievance would be diminished, and consequently, so too would the foundation of revolution). Although Marx would argue that free trade would be the quickest fulfilment of the capitalist system, and thus its end, Bernstein viewed protectionism as helping only a selective few, being fortschrittsfeindlich (anti-progressive), for its negative effects on the masses. Germany's protectionism, Bernstein argued, was only based on political expediency, isolating Germany from the world (especially from Britain), creating an autarchy that would only result in conflict between Germany and the rest of the world. "The Communist Manifesto was correct…but…we see the privileges of the capitalist bourgeoisie yielding…to democratic organization.…In my judgment…success lies in a steady [peaceful] advance…[rather]…than in…a catastrophic crash." ↑ R. A. Fletcher, 1983, Cobden as Educator: The Free-Trade Internationalism of Eduard Bernstein, 1899-1914 88 (3): 561-578. This page was last modified on 25 September 2017, at 19:35.